Volume 11 of the Gabriel Wells Definitive Edition of Mark Twain's works is Life on the Mississippi. It features an Appreciation written by Meredith Nicholson. Nicholson (like Booth Tarkington who wrote the Appreciation for the Wells edition of The Adventures of Tom Sawyer) was a native of Indiana. Nicholson was born in Crawfordsville, Indiana in December 1866. His formal education ended at age fifteen after which he began work in a newspaper office while studying law at a local law firm. At age eighteen he sold his first poem to a New York newspaper for $3 and a short piece of fiction to a Chicago paper for $10. Nicholson's law studies soon gave way to his love of writing and literature. From 1885 - 1897 Nicholson was employed on the editorial staff of the Indianapolis News. Much like Samuel Clemens, he tuned his literary skills in a newspaper office. His first book of poems titled Short Flights was released in 1891. When Nicholson married in 1896, Booth Tarkington served as his best man. Shortly after marrying, Nicholson left the Indianapolis News and worked as a stockbroker in Indianapolis for a year before moving west to Colorado where he worked as an executive in a coal mining corporation. The couple returned to Indiana in 1901 where Nicholson concentrated on his writing career. In 1905 Nicholson's third novel A House of a Thousand Candles became a best seller. An inventory of Samuel Clemens's personal library indicates he owned a copy of A House of a Thousand Candles as well as Nicholson's 1908 novel The Port of Missing Men. 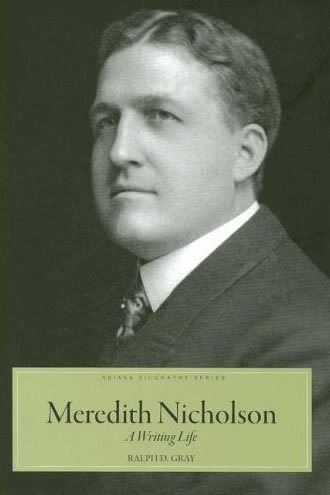 Nicholson's body of literary output between 1902 and 1929 includes at least 20 novels along with collections of poetry, short stories and magazine contributions. Nicholson was an active Democrat who fought against the Ku Klux Klan's influence in Indiana politics. A man of great personal magnetism and charm, his participation in politics was parlayed into diplomatic positions after his literary career waned. In 1933 he served as a diplomat in Paraguay. This position was followed by appointments as a diplomat in Venezuela and Nicaragua. Nicholson retired from diplomatic service in 1941 and died in December 1947. THERE ought to be some court of broad jurisdiction with power to restrain the spirit of progress whenever it threatens places, customs and manners upon which literature has conferred immortality. Nothing so depresses the pious pilgrim as the realization that he seeks what has ceased to be. I have always thought of the Mississippi as Mark Twain's river, a feature of the American landscape ordained of all time to be his playground. De Soto's discovery and La Salle's explorations have seemed negligible from the time, now remote when I first perused Life on the Mississippi, a work which established Mark Twain's inalienable title to the Father of Waters. In St. Louis the other day I committed myself to a taxi and bade the driver carry me to the river. The journey was not without peril, for my intrepid guide rushed me through a seething railroad yard on the water front where locomotives hissed contemptuously at the only steamboats in sight-two excursion boats not to be mistaken for the noble packets that flourished in the golden days when Samuel L. Clemens carried a pilot's license in his pocket. But here I was, on the municipal dock, where a crane was hoisting freight from the compartments of a steel barge in a most business-like fashion. The superintendent smiled sympathetically when I told him that I was looking for traces of Mark Twain. "Thought you'd find the singing niggers," he remarked. "Well, things have changed some." That jaunty crane was no adequate substitute for a phalanx of lusty negroes unloading a cargo to the accompaniment of the bloodcurdling maledictions of a cursing mate! Mark Twain pronounced Mississippi river steam boating dead in the early '70's, though it is evident that on the cruise described in these enthralling pages he found enough remaining of the old romantic times to evoke stirring memories of a glorious past. It is fortunate for history and literature that he produced this narrative of an economic and social order now vanished, and nowhere else so understandingly and beguilingly described. The fact that the Time Spirit has so relentlessly changed the aspect of the river life only adds to the value of this chronicle. Humor is a great preservative and here we have fact and drollery mingled in a fashion of which Mark Twain was the incomparable master. There is a fitness in the very manner of its composition. Those delightful inadvertences and disgressions so characteristic of the author's method are, the reader is persuaded, only an expression of a like capriciousness and impatience of restraint in the river itself. In frequent rereadings I have never failed to experience again the joy of my first perusal. Life on the Mississippi is an imperishable saga, in which the lordly river is not merely the chief character but in no mean sense the veritable protagonist of American democracy. LIFE on the Mississippi was written in two distinct parts. The first twenty chapters were contributed to the Atlantic Monthly in 1875, while the remainder was not undertaken until after Mark Twain's return to the Mississippi in 1882. I take back the remark that I can't write for the January number, for Twichell and I have had a long walk in the woods, and I got to telling him of the old Mississippi days of steam-boating glory and grandeur as I saw them (during four years) from the pilot-house. He said, "What a virgin subject to hurl into a magazine!" I hadn't thought of that before. Would you like a series of papers to run through three months or six or nine-or about four months, say? Howells welcomed this offer as an echo of his own thought. He had come of a piloting family himself, and knew the interest and the charm that Mark Twain would put into such a series. Clemens forthwith sent the first chapter of that altogether unique story of Mississippi life which to-day constitutes one of his chief claims to immortality. He forwarded it to Howells with a note. "Cut it, scarify it, reject it, handle it with entire freedom," he wrote. The piece about the Mississippi is capital. It almost made the water in our ice-pitcher muddy as I read it. ... I want the sketches if you can make them -- every month! And yet I have spoken of nothing but piloting as a science, so far, and I doubt if I ever get beyond that portion of my subject. And I don't care to. ... Its newness pleases me all the time, and it is about the only new subject I know of. He became so enthusiastic presently that he wanted to take Howells with him on the trip down the Mississippi, with their wives for company -- to go over the old ground again and obtain added material enough for the book. Howells could not get away, and the trip was postponed indefinitely. If I might put in my jaw at this point, I should say, stick to actual fact and character in the thing, and give things in detail. All that belongs to the old river life is novel, and is now mostly historical. Don't write at any supposed Atlantic audience, but yarn it off as if into my sympathetic ear. Clemens replied that he had no dread of the Atlantic audience; he declared that it was the only audience that did not require a humorist to "paint himself striped and stand on his head to amuse it." These papers were printed under the title of Old Times on the Mississippi, and ran through seven numbers of the Atlantic. They were reprinted everywhere, and promptly pirated in book form in Canada. Clemens, however, did not care to issue so small a volume, and he was not yet ready to add the chapters that would fill a large one. It was five years later, in the spring of 1882, that he arranged with James R. Osgood, who had become his publisher, to revisit the old scenes of his piloting days, to look up old friends, and to tell the story of steamboating in the days of its decline. Besides Osgood he took with him a stenographer -- a young man named Roswell Phelps, of Hartford. They traveled by rail to St. Louis, and took passage down the river on the steamer Gold Dust. "The pilot would lie down and sleep, and leave me there dreaming that the years had not slipped away; that there had been no war, no mining days, no literary adventures; that I was still happy and care-free, as I had been years before." He was a young fellow in his twenties again, speculating on the problems of existence, reading his fortune in the stars. To heighten the illusion he had himself called regularly with the four-o'clock watch, in order not to miss the mornings. It is perfect: no more nor less. I don't see how you do it. The remaining chapters of the book are of a different class. They have their own charm and interest, but the poetry and romance of those early days are not, and could not be, in them. The work as a whole added much to Mark Twain's literary prestige, and it is one of his books that will live longest in the memory of men. The Gabriel Wells Definitive Edition of Life on the Mississippi features the same frontispiece and the five illustrations by Edmund Henry Garrett that had appeared in the 1899 uniform editions of Life on the Mississippi published by American Publishing Company. Dunn, Jacob Piatt and William Harrison Kemper. Indiana and Indianans, Volume 3. (The American Historical Society, 1919). Online via google books. Fertig, Walter L. "Meredith Nicholson." Accessed 5 June 2010. Gray, Ralph D., ed. A Meredith Nicholson Reader. (AuthorHouse, 2007). "M. Nicholson Dead: Author, Diplomat," The New York Times, 22 December 1947, p. 21.